The largest living fish, whale sharks, may increasingly be using volcanic islands off the western coast of Europe as a new home as sea surface temperatures rise, researchers say. This finding could shed light on how climate change might alter the behavior of fish globally, the scientists added. The whale shark is a titan, known to reach up to 41.5 feet (12.65 meters) in length and 47,000 lbs. (21,500 kilograms) in weight, and some anecdotes suggest they can get even larger. Unlike predators such as great white sharks, whale sharks are gentle giants, using rows of their tiny teeth as a filter to strain out tiny creatures in the water for meals, just like the largest whales do. "Whale sharks are the largest living fish, yet they are also very elusive," said lead study author Pedro Afonso, a marine and fisheries ecologist at the University of the Azores. To better understand why these gargantuan fish appear more often around the Azores, the scientists analyzed data on whale shark sightings gathered over 16 years, from 1998 to 2013, by observers on tuna fishing boats. Fishermen in the Azores have long detected tuna by looking for whale sharks, locally known as 'pintados' — Portuguese for "spotted," referring to the sharks' spotted skin. Afonso noted "there was no way we would get to know anything about whale shark occurrences" without observers on these tuna fishing boats. The area in which the whale sharks are seen around the Azores "is 1 million square kilometers [386,000 square miles], easy," Afonso said. The researchers used computer models to investigate the patterns of whale shark sightings over time and space, in relation to factors such as food, sea surface temperatures and seafloor features. The scientists found a sharp rise in whale shark sightings in the exceptionally warm year of 2008, and the giant fish became regular visitors to the region afterward. 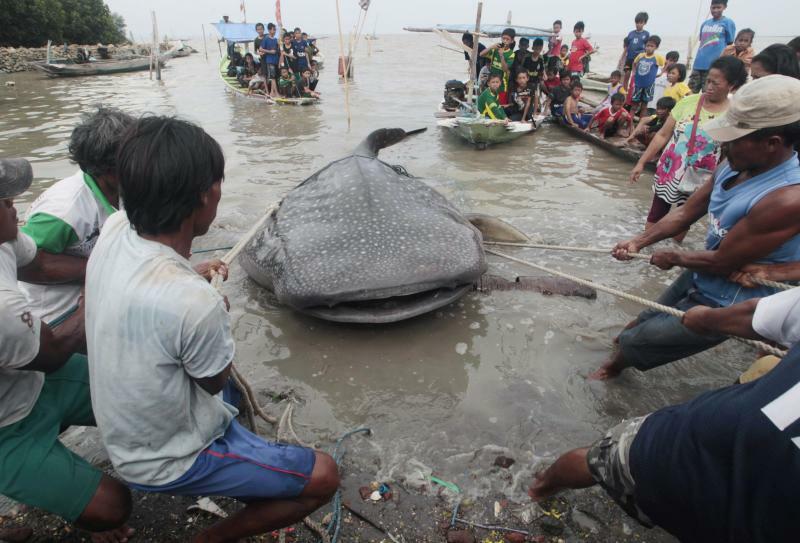 The scientists also found that sea surface temperatures helped predict whale shark sightings. For example, higher water temperatures around the southernmost Azores Island of Santa Maria were associated with more sightings of the fish. Observers also spotted the sharks more often in areas with underwater hills and mountains; these seafloor features coincide with large amounts of photosynthetic organisms that feed the creatures that the whale sharks eat. These findings are a window into what might happen as climate changes globally, the scientists said. "Large marine animals such as the whale shark can change their oceanic distributions depending on regional conditions," Afonso said. Future research could investigate why whale sharks remain in this area during the summer. "Is it only the food around the seamounts, or something else — maybe the presence of other whale sharks to mate with?" Afonso said. Afonso and his colleagues Niall McGinty and Miguel Machete detailed their findings online today (July 16) in the journal PLOS ONE. Follow us @livescience, Facebook & Google+. Original article on Live Science.